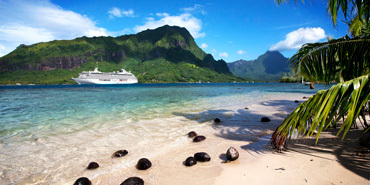 Premium cruises occupy the space between affordable mainstream lines (Carnival, Royal Caribbean, and Norwegian) and high-class luxury lines (Crystal, Seabourn and Regent Seven Seas). This is most evident in the price point as premium sailings are more expensive than a mass-market cruise, but won’t give you the sticker shock of luxury sailings costing upwards of $400 per night, per person. Premium ships tend to be much larger than luxury ships (think 1,500 to 3,000 passengers) but come with bigger staterooms and a higher crew-to-passenger ratio. Amenities such as beverage packages and WiFi are either included as part of an early booking bonus or purchased at a lower rate than mass-market lines. With the slightly higher price tag upfront, premium ships generally have a minimal number of children on board with the exception of some multi-generational families traveling together during school breaks. Couples and families with older teens who like the idea of sailing without the actual need for wind. Children, as well as anyone who needs a lot of organized activities. Couples who prefer medium- or small-ship cruising with a resort-casual dress code. Families or intergenerational groups with teens or kids. Sophisticated couples or friends who like great food, wine, design, art, and service. Families — the line just launched its first kids’ club program on a limited basis. Seniors, families, anglophiles, and those wanting to relive the glory days of ocean liners. Sea-day haters and those who get seasick easily.